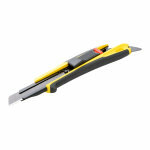 Excellent choice for high-performance cutting. You are sure to appreciate the convenient fin for prying open paint cans. 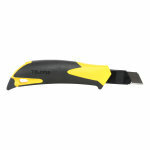 Tajima Quick Back 18mm snap-off knife is an excellent choice for high-performance cutting. 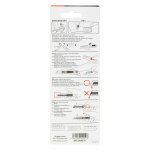 You are sure to appreciate the convenient fin for prying open paint cans, scoring and piercing carton tape. The working end of the knife can also be used as a screw driver. You'll gain automatic blade retraction to protect against accidental cuts. The knife can also switch to standard auto-lock mode, because of an advanced self-retracting system. 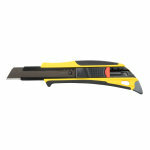 As a result you'll be assured of safe blade handing and a world leading, full feature snap off knife! Expect an 18mm snap-off knife pre-loaded with a premium Tajima Razar Black Blade. Produced with a stainless steel blade guide secured to a hardwearing plastic and rubberised casing for improved comfort and control. The blade is made with premium SK-120 steel.